Police and jail chiefs say expanding health coverage can reduce crime. Gary Herbert, Utah’s Republican governor, has a health-care problem. Under the Affordable Care Act, states are eligible for federal money to pay for expanding access to Medicaid, the health insurance program for the poor. 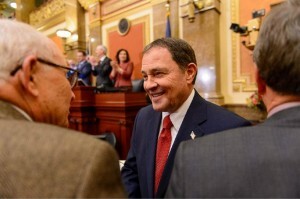 Herbert’s spent more than a year pushing Utah’s GOP-controlled legislature to accept the cash, but he’s run into resistance from conservatives opposed to Obamacare. Lately he’s gotten help making his case from an interest group not known for its liberal inclinations: cops. Police chiefs and sheriffs who run local jails in states that haven’t expanded Medicaid are coming out in favor of Obamacare on the grounds that it could help drug addicts and people with mental illness get help before they commit crimes. Thirty states have increased access to Medicaid. Broadening eligibility could extend coverage to about 3.7 million people in 20 states, according to estimates from the Kaiser Family Foundation. That includes 30,000 in Utah, about 1 percent of the state’s population.